jane iredale MASTERCLASS Goes Upscale | iiaa Ltd | The UK and Ireland distributor of Environ Skincare, jane iredale makeup and Advanced Nutrition Programme. Sara Chow, business development consultant and make-up artist for the iiaa, recently supported jane iredale stockist Modesty HMS, by hosting a glamorous Mineral Make-Up Masterclass. While most of the iiaa’s events are held in-salon with smaller groups, Modesty HMS went upscale to spread the word. 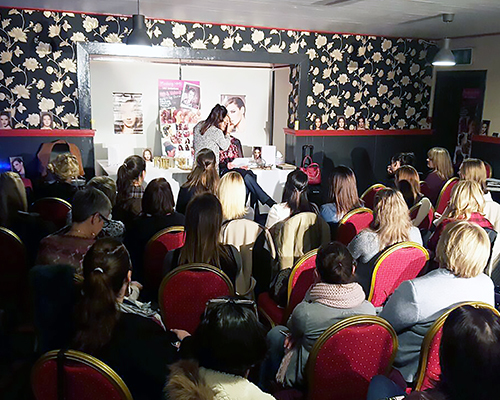 Sara said: “Sharon Murphy, the salon owner at Modesty HMS, had recently taken on jane iredale and wanted to run a big event to raise awareness of the brand and to grow her business.” Sharon rented out a function room and 35 guests enjoyed pre-masterclass nibbles and champagne. Sara added: “I recreated our Signature Looks on three models and gave a talk on how amazing jane iredale products are. It was a very successful night, bringing in lots of revenue for Sharon. Most importantly, the event raised brand awareness and everyone’s talking about it!” To book one of our make-up artists for a business-boosting jane iredale event, email events@iiaa.eu.